One of the hardest things I do during the day is tie my shoes. I learned very early in my childhood years to loop one, loop the other, and then tie them together. (I have heard that the instruction is, “Rabbit ears, rabbit ears, then tie,” but I guess I lost out on the rabbit.) Anyway, I’ve tied my shoes for years without any problem. I guess cancer, plus back problems, has made this more difficult. So early in the morning it is even harder to make my hands obey my commands. Recently, I was standing in a restaurant with a friend and he noticed my shoes were untied. He stopped me, pointed it out, and proceeded to bend down on the ground to tie my shoes. He continued to explain how he taught his own children to tie their shoes. He tied them twice in a double knot. It was so very thoughtful. I was overcome by his humble spirit–his “servanthood.” Those laces were tight. They were meant to be tight. They were meant to keep the shoes tight on my feet. That night, I couldn’t get my shoes off. I couldn’t untie the laces. So, I slipped them off without untying the shoes . 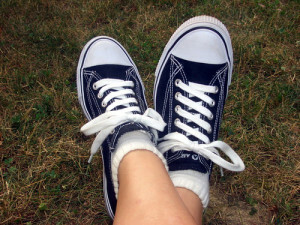 I thought of my friend who had taken the time to be sure that I wouldn’t trip and fall with untied shoes. My friend was the hands and feet of Christ. This experience reminded me of Christ Himself. Christ has given me all the instruction and skills I need to be sure that I don’t fall in my daily walk with Him. But, I sometimes find myself a bit “untied” or “stumbling” as I walk each day in life. Why would I not trust the plan He has for my life? HE has “double tied” my security with Him by giving His life for me. How can I not WALK each day overwhelmed by His love? Why would I ever want to untie my relationship with Him? I want to be tight … double-knot tight with Christ … walking through life today and every day.